This sounds cool! Read on for a neat event that's free and open to everyone. 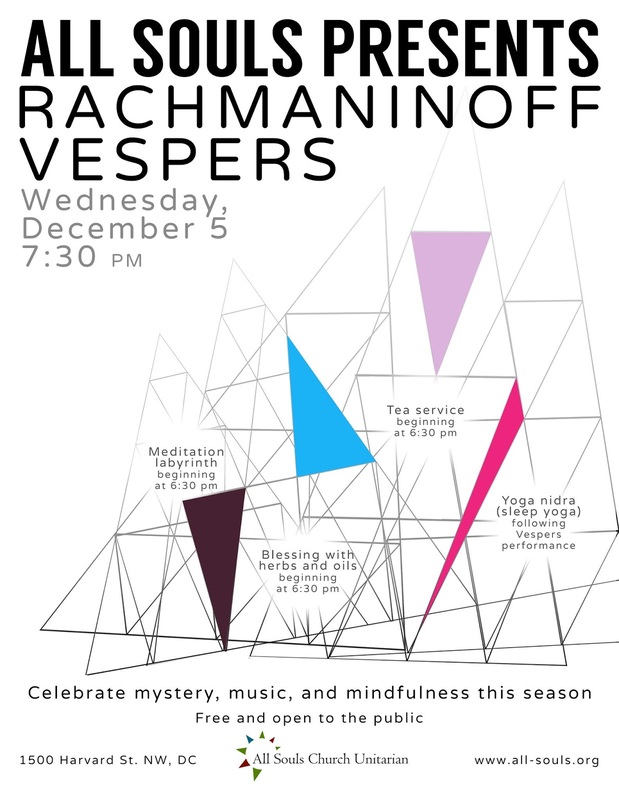 Embark on the holiday season with mystery, music, and mindfulness at a unique event on Wednesday night, December 5, at All Souls Church, 1500 Harvard Street NW at 16th Street NW. Starting at 6:30 pm, attendees may participate in an open tea service; a walking/meditation labyrinth created with natural elements; and individual anointing/blessing with oils and herbs for those who wish to partake. At 7:30 pm, Sergei Rachmaninoff's iconic choral masterpiece, the All-Night Vigil (Opus 37), also known as the "Rachmaninoff Vespers," will be performed in the sanctuary by the All Souls Choir. Exquisitely rich harmonies, based on Russian Orthodox chants, have made it a cornerstone of a cappella choral music and enchanted audiences since its premiere in 1915. Immediately after the performance, all are invited to stay for yoga nidra ("sleep yoga"). "As we approach the darkest season of the year, we invite you to kindle and nurture the light within," says Director of Music & Arts Jen Hayman. She may be contacted at jhayman@allsouls.ws for more information.